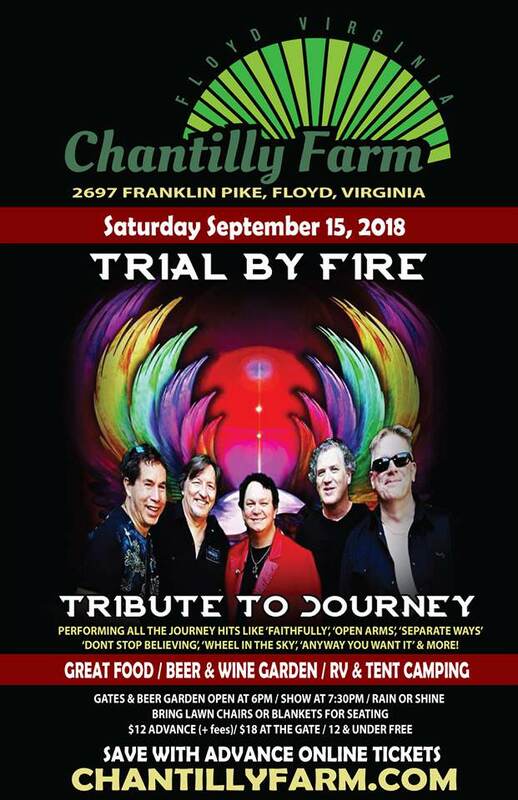 Chantilly Farm presents the Third Annual Buses at Chantilly Concert featuring Trial By Fire, A Tribute to Journey on Saturday, September 15, 2018. Buses at Chantilly is a Volkswagen Bus Rally and Campout in the beautiful Blue Ridge Mountains of Floyd, Virginia coordinated by Floyd County’s own, David Wood from Friday, September 14, 2018 through Sunday, September 16, 2018. As part of Buses at Chantilly, enjoy a special concert that all are welcome to attend. Trial by Fire is a premier Journey tribute band that has been enthralling and captivating crowds since 2009. Based out of Charlotte, North Carolina, this group of incredibly talented rock musicians brings the legendary live experience of Journey wherever they play. With their all-star performances packing venues across the East Coast, this is one show you surely won’t want to miss! In 1996, arena rock superstars Journey put the band back together to record their tenth studio album, Trial by Fire. Shortly after the release of this reunion album lead singer and signature voice, Steve Perry injured himself while training for what was to be a high energy road show. With Steve Perry unable to perform, the Trial by Fire tour became “the tour that never happened”. Imagine if Steve Perry had never injured himself on that fateful day. What would the Trial by Fire tour look like? Flash forward to the present. Trial By Fire is born out of the hearts of five seasoned North Carolina – based musicians who have decided to answer that question. It is their vision to bring that 1996 tour to Journey fans across the country; to embrace the sound and visuals of the Steve Perry era of Journey. Prepare to let Trial By Fire take you back to an earlier day when lighters were held high, and you couldn’t help but sing along to such powerful choruses as “Don’t Stop Believin’”, “Wheel in the Sky”, “Lights”, “Separate Ways” and “Faithfully”. Tickets are $12.00 in advance and $18.00 at the door. Note: Advance tickets incur a small surcharge from our ticketing provider. To purchase tickets online, visit: https://chantillyfarm.com/wp/event/1379/. Doors and the Beer Garden open at 6:00 pm and the show begins at 7:30 pm. No coolers or pets. Fool will be available for purchase. Beer and wine garden available for those 21 and older. Bring lawn chairs and/or blankets for seating. To view the event flyer, visit: https://i.imgur.com/x36o794.jpg. For more information, visit: https://chantillyfarm.com/wp/event/1379/ or https://www.facebook.com/chantillyfarm or https://www.facebook.com/events/181137929171659/ or call 540-353-5898 or email chantillyfarm@gmail.com.